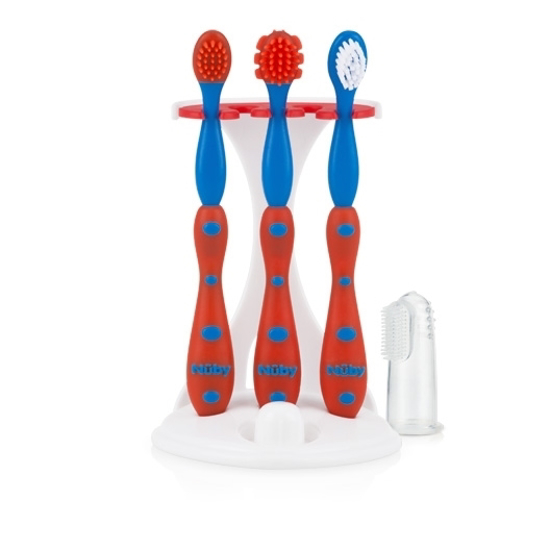 This Nûby™ Oral Care Set is a 4 stage system that is perfectly sized to help protect your baby's primary teeth. 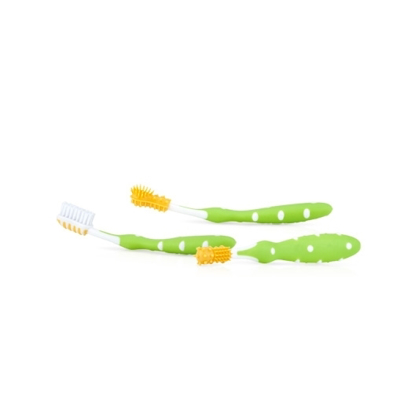 These Nûby™ beginner toothbrushes promote the early development of good dental hygiene. The bristles on each brush are designed especially with a child in mind. The result of this special attention to detail is a product your child can use with ease. Silicone Massager: It is designed for babies under 3 months of age and made of extra soft silicone with your baby's comfort in mind. The hollow body make this massager easy to slip over parent's finger to use on baby. Three different surfaces allow the parent multiple options for cleaning and soothing tender gums. Massaging Brush #1: It is designed for babies over 3 months of age. It has been specifically designed to feel soft on the baby's gums. It allows parents to brush and massage gums gently. Massaging Brush #2: It is designed for babies over 11 months of age. This brush massages and helps clean during the teething process. Also, this age is the ideal time to teach your child proper brushing habits and encourage the start of good oral health. Nylon Bristle Brush: Designed for babies with teeth. Ask your doctor or dentist about when to switch to the soft nylon brush once teething begins. And remember, until your child has the dexterity to do it alone, you should follow up with additional brushing, etc. until they are older. All of these pieces have a place on the included stand that is great for convenient use.